Vinyl banners are normally laid out in two colors, The difference between Vinyl and Digital Banners is that Wording and Graphics on a vinyl banner are cut out of adhesive vinyl making it this way highly durable, and resistant to extreme weather conditions, while regular printed banners are the result of the Computer design on a Sign Design software, sent to a printer, passing through an interface called RIP which normally converts the files so the Digital Printer can recognize and print the image, generally on a scrim vinyl material. If you are looking to have a banner in a location where the banner will stand out exposed to exterior weather conditions, Vinyl Banner is the option, Vinyl Banners are made with contour cut material usually processed with a cutting plotter while a Printer banner comes out from a Digital Wide Format Printer. 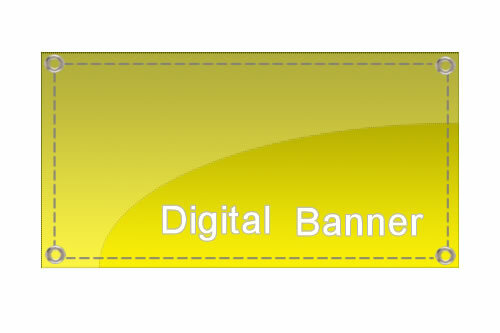 Very few Print shops are offering vinyl banners anymore, if so don’t expect to get them at the same price as the process to get a vinyl banner is twice or three times the effort of printing a regular banner. Call Quick Signs and we can give you advice to choose the best material for your next banner. We usually get calls from customers asking for Banner Signs, Vinyl Banners or outdoor signs, we understand every body’s expertise is on their own business field, at Quick Signs our business is making Signs for many different advertising purposes, so don’t worry! Call us and request any signs you want; we are going to make sure that the sign you are requesting is the one you really mean. Want to order a Custom Banner today?